What’s up people? The weather has been relatively all over the place for a Chicago summer, but that doesn’t mean that you can’t try some new and consistently delicious food. 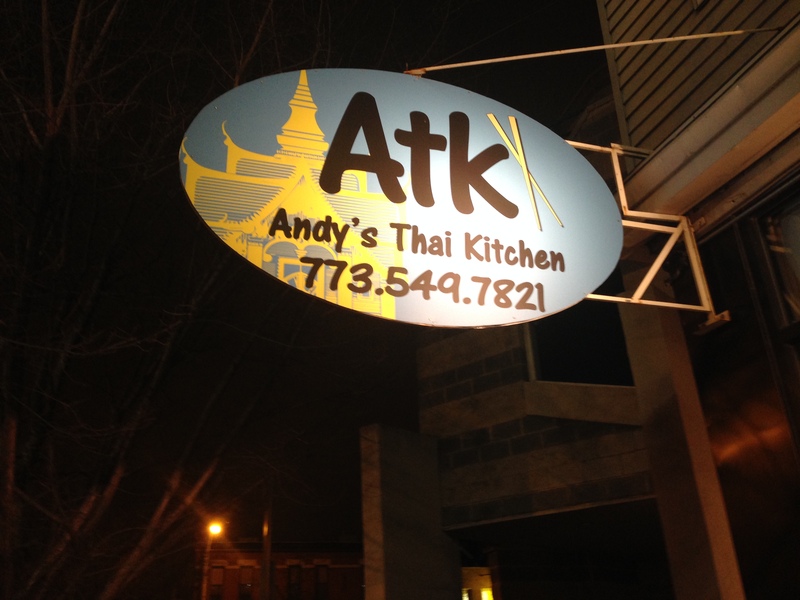 Enter Andy’s Thai Kitchen that me and my girlfriend hit up for her gusband’s birthday. I was not really super excited about getting Thai food since it just all seems like the same thing, similar to my thoughts about Vietnamese food, but Andy’s Thai Kitchen managed to change my mind. 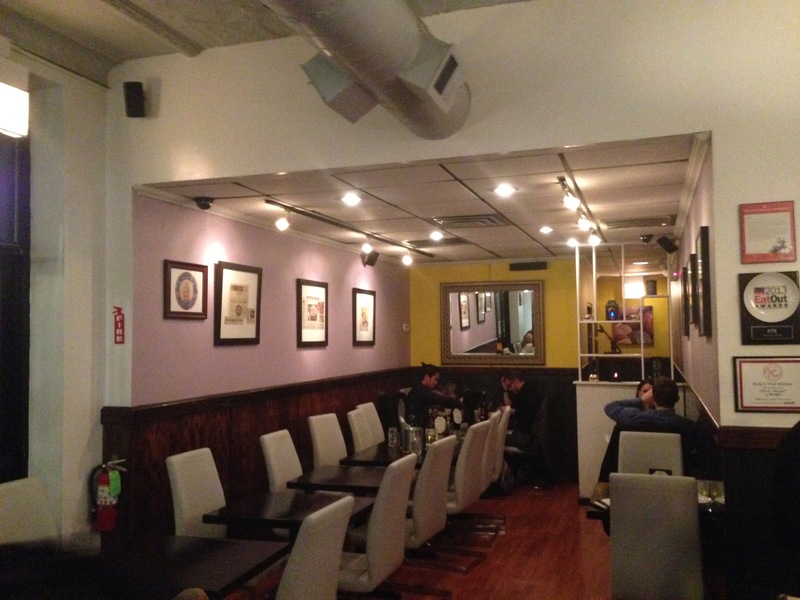 While the weather was quite cold outside, the interior is very warm and welcoming. Not only that, but the body heat from the masses of people waiting at the narrow vestibule made the experience seem all the more chaotic. It could almost be an homage to the organized madness that is synonymous with Southeast Asian cities like Bangkok. Chef Andy Aroourasameruang brings the unadulterated flavors of his home, Chachoengsao Province, to Chicago in the form of one of the most unique Thai menus I’ve seen in a long while. I had never been there before, but all of my other diners had visited it before. So, I let them order most of the food for our meal aside from my entree. 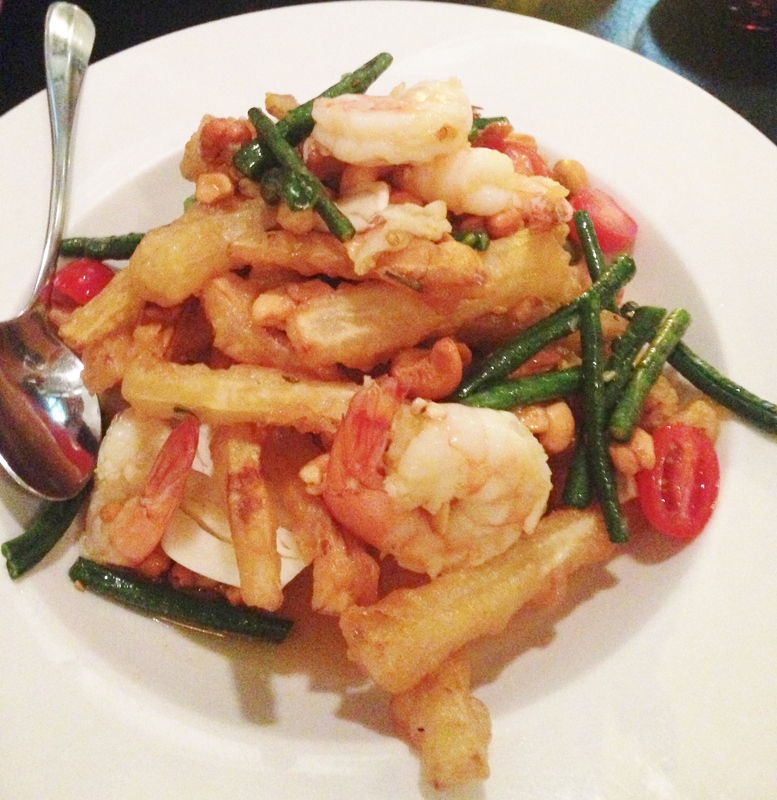 First, we started the meal with the som tum tod or fried papaya salad ($12). Unfortunately, this was during Lent, and I had given up all fried foods. So, based on the reaction of my fellow diners digging into the colorful melange of deep fried papaya sticks, giant pink shrimp, cashews, tomatoes, and green beans, they loved all of it. 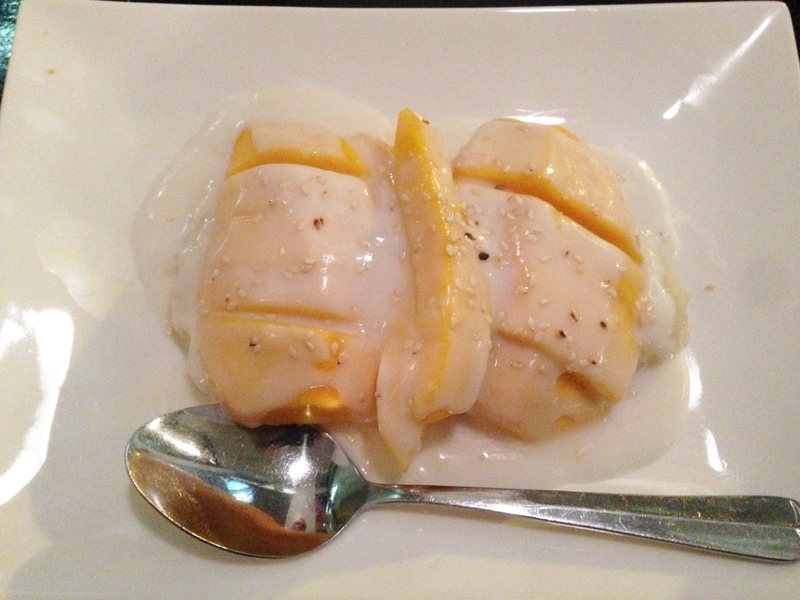 It was presented differently than other mango salads I’ve seen in Thai cuisine given that the mango was actually fried and not served in its original form. 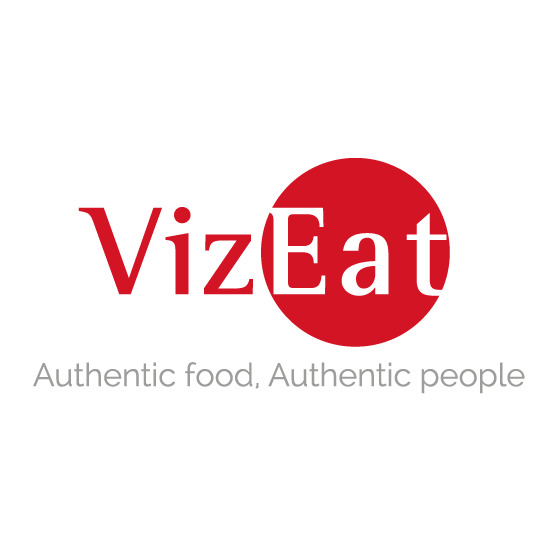 I’d recommend it though since I ate the shrimp together with the veggies. The spicy lime dressing gave it a perfect tangy/fiery zip to keep you coming back for more. As for the entrees, I went with the ATK signature dish: wild boar pad ped ($11). Basically, it was a spicy red coconut curry that had “young pepper” (whatever that is), slow cooked and stir fried boar, and Thai eggplants. The curry was very rich and flavorful with a potent kick, and there was a ton of tender boar that seemed like slightly gamier beef. It should have been tougher, but the slow cooking made it fall apart in my mouth. The Thai eggplants were a new addition to foods I’ve never tried before, but I was pleasantly surprised. Even though they looked like tiny halves of lime in my curry, they added more of a half-crunchy, half creamy element to the softer parts of my meal. The only downside was that I think that they could add a wider variety of vegetables to the sauce. As for Janice, she got the basil crispy pork belly ($10.95) which was another ATK signature dish. 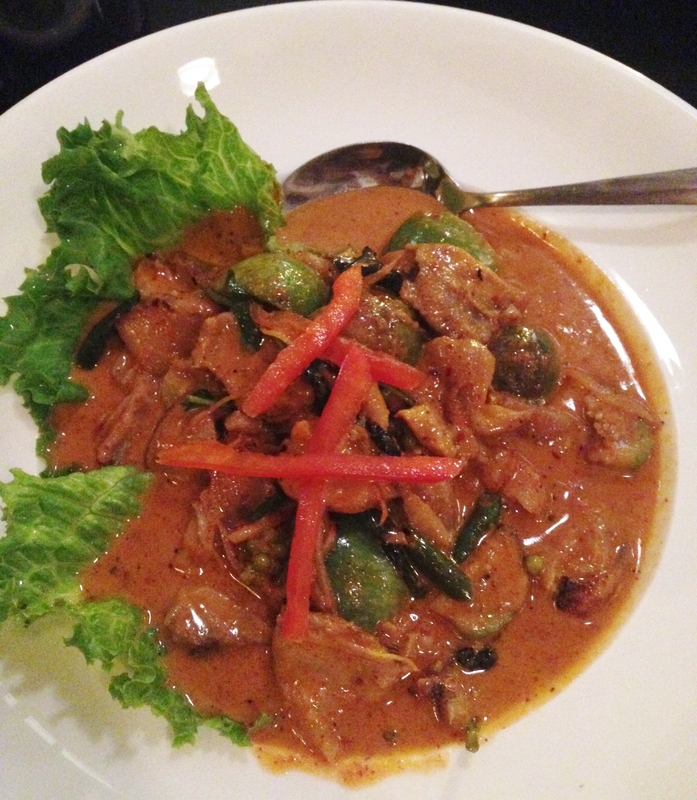 This one wasn’t as elaborate as my curry, but it still brought big flavors that Thai cuisine is known for. 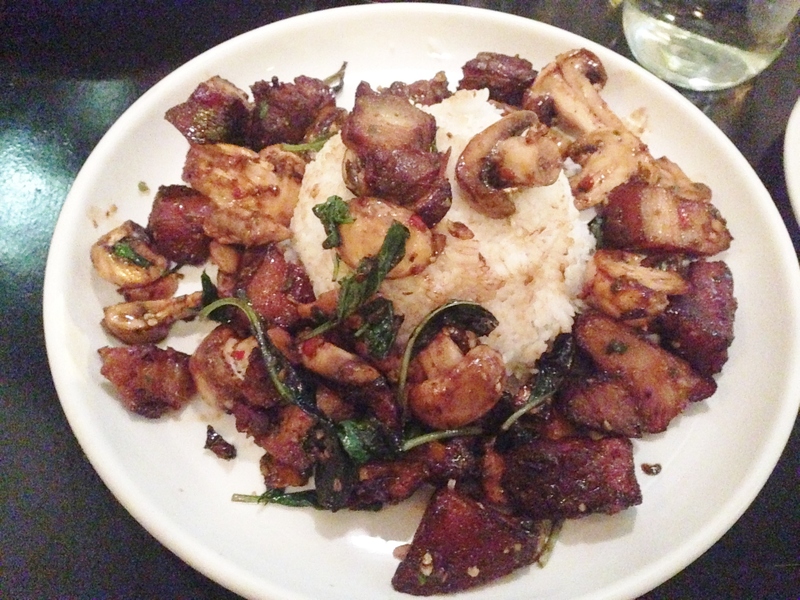 It basically was rice served with a plentiful helping of stir fried pork pieces along with mushrooms, garlic, chili, and basil leaves. It was good but not great. The meat was the best part with its crispy outer layer that gave way to multiple alternating layers of fat and juicy pork, but it became somewhat monotonous according to Janice. Thankfully, the food party didn’t stop there since there was still the matter of dessert. 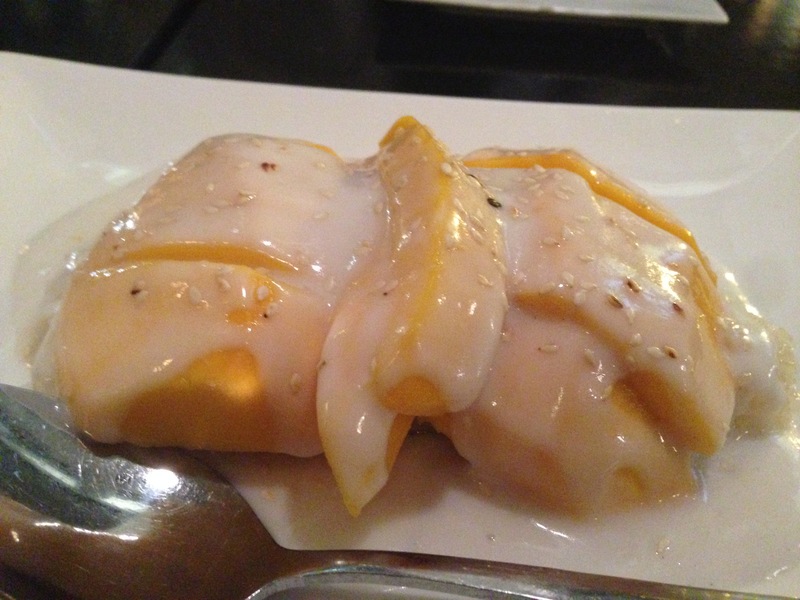 While most of the options had a distinctly South/Southeast Asian flavor like the fried roti or banana blanket, we had to go with the customer pick, the mango sticky rice ($7). I was surprised to see what it actually looked like when it came out. After living in Korea, I was skeptical of desserts boasting, in my eyes, typically savory elements like rice or beans. However, this dessert might have turned my head a bit with its fresh layer of sliced mangoes and generous helping of coconut milk. It was like eating a Southeast Asian version of bread pudding with the rice taking the place of the flour based dough. I highly recommend this sweet treat. 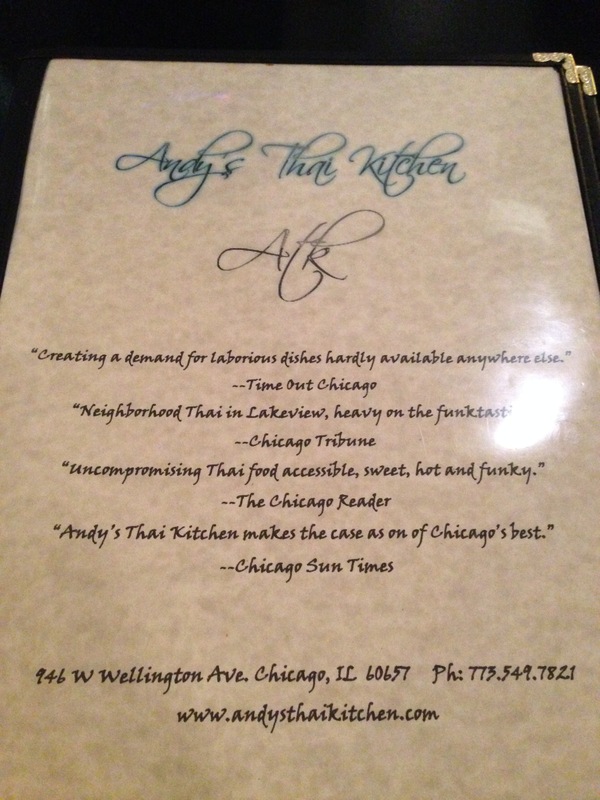 So if you’re looking for a restaurant that offers quality and unique Thai dishes, enjoy a great meal at Andy’s Thai Kitchen!